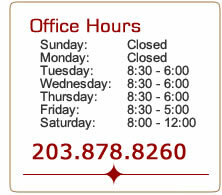 We have been serving the greater Milford area for more than 40 years. Our reputation for quality and accuracy is unsurpassed. The staff of opticians and stylists is well seasoned. They provide a truly personal touch to all of our patients and customers. Our environment is relaxing and there are only advisors not sales people assisting you in your selection of eyewear or any other services. This type of customer service is the key to our success. We always provide top quality service to our community. So if you decide to choose us for your eye care and eyewear needs, we will not disappoint you.